A few years ago, I read A Hero of Our Time by Russian writer Mikhail Lermontov, and the novel became one of the astonishing reads of my lifetime–not only is this an absolutely wonderful book, but it encouraged me to start reading more Russian stuff. Up to that point, I’d been a bit overwhelmed by the sheer volume of some of the more famous entries into Russian literature–plus then there’s that patronymic thing. 1) It was perfect timing. I’d been reading Nabokov and he translated my version of A Hero of Our Time. 2) A Hero of Our Time was mentioned–albeit briefly in a wonderful French film Un Coeur en Hiver. This was nagging away at the back of my mind. As it turns out these two points are important but more of that later. One of my goals for 2010 was to reread A Hero of Our Time, but before I did that I decided to read a nonfiction book about Lermontov. That book was Lermontov: Tragedy in the Caucasus by Laurence Kelly (my last post). Armed with that background, I returned to A Hero of Our Time. Kelly’s book really is a good companion to A Hero of Our Time as it places the novel in the context of Lermontov’s life. Kelly makes the point that Lermontov fell in love with the Caucasus during his childhood trips to the region, and many of the characters in A Hero of Our Time are identified as people Lermontov met in the Caucasus during his periods of exile. 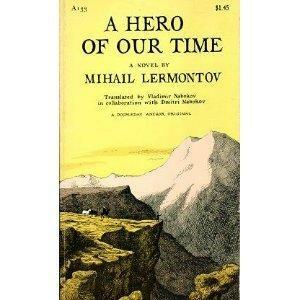 Lermontov wrote the novel in 1839 just two years before his death in 1841. A Hero of Our Time is set in the wilds of the Caucasus in the 1830s and begins with the travels of an unnamed Russian narrator. On an arduous journey, hampered by rough terrain and harsh weather conditions, the narrator meets a tough old soldier, Maksim Maksimich. Circumstances force the two men together, and eventually the narrator, eager for a story from the older man, leads Maxim into telling a fantastic tale. While Maxim’s story represents one of the five sections of Lermontov’s novel, A Hero of Our Time is really a collection of five stories–all set in the Caucasus and all concerning, to some degree or another the very romantic figure of a young officer named Pechorin. In the first story, the narrator and Maxim are stuck in a smoke-filled hovel together and Maxim tells the tale of a reckless, young officer named Pechorin who steals a wild Circassian girl, Bela, with the aid of her brother. In exchange for the brother’s help, Pechorin steals a much-prized horse that belongs to a notorious bandit. Maksim describes the tragedy that unfolds between Pechorin, Bela and the bandit. It is through Maxim’s tale that we are introduced to the hero, Pechorin, and in the book’s next section, Maxim Maksimich Pechorin makes a brief appearance at an inn before he throws his notebooks away and takes off for yet another adventure in Persia. The narrator retrieves the notebooks, and the final three chapters of the book are taken from these notebooks and relate some of Pechorin’s colourful adventures. Pechorin is a marvelously complex character, and in the best chapter in the book, Princess Mary Pechorin’s murky motivations are explored in great detail. Stuck at the resort of Pyatigorsk, Pechorin amuses himself–rather cruelly–with a high-ranking Princess. While she is the object of another young male’s attention, Pechorin proceeds to play a dangerous cat-and-mouse game with the girl and this eventually results in a duel. In this untamed land, Pechorin, very much a Byronic hero, is perpetually bored and as a seeker of new adventures–he runs wild and unleashed far from the restrictions of suffcoating St. Petersburg culture. Of course what he does with this freedom is another matter. Great novel! One of many in Russian literature! I am trying to read Russian books.